Viva the cottage cheese intifada! One of my sons maintains his sanity by allotting less than 1 percent of his attention to Israeli and regional politics. But when I returned from a trip overseas last week he chided me for buying cottage cheese. I must admit that news of what our local media call the “cottage cheese intifada” did not reach me in Albania. The Albanians have their own problems and interests, such as finding out what an Israeli journalist visiting their country thinks of it. Less then 24 hours after I’d set foot in the southern city of Saranda I was interviewed by the local TV station. Six days later, a half-page article with my picture, all based on the TV interview, appeared in what I was told is the country’s “serious” newspaper. Albanians don’t have time for cottage cheese wars. Nor do our Egyptian neighbors, 1,000 of whom were reportedly wounded this week in the continuation of their uprising in Taghrir Square, or our Syrian neighbors, hundreds of whom have been killed, on orders of their president, while protesting. It’s nice to know that Israelis will rise up for a cause, after being glued to their armchairs for so long. But for cottage cheese? It was okay for Israel to send the transsexual diva Dana International as its representative this year to the Eurovision song contest—watched by some 125 million people. And that was not her first time at Eurovision. Now there’s a flap over the scheduled performance of singer Harel Skaat as part of a salute to National Service volunteers. Most of the volunteers are young women who declare that they are religiously observant and thus are exempt from compulsory military service. Skaat came out of the closet in 2010. The daily Ha’aretz reported that a rabbi and a Knesset member said they had received many complaints from women in National Service about Skaat’s scheduled performance. But Sar-Shalom Jerbi, the director of National Service, was unmoved. Apparently, finding a singer who had completed military or national service was no easy task, and that was Jerby’s main criterion. According to Ha’aretz, Skaat’s PR commented that this would not be his first performance before the women of the National Service and that he was delighted to be doing so again. Bus stops in the northern city of Haifa now have a delightful addition: shelves with free books. Ha’aretz reports that artist Daniel Shoshan, a senior lecturer in the Technion’s Architecture Faculty, and recent graduate Amit Matalon have been putting up the shelves for the past few months in the hopes of creating a free lending network. The artists plan to continue the project in other cities around the country, and requests are already pouring in. Jewish dietary laws were very far from my mind when I booked tickets to a production of Rodgers and Hammerstein’s Carousel, in which much of the second act takes place at a clambake in Maine. The musical came to the Holy City courtesy of Encore, a local amateur theater company whose enjoyable production of Gilbert and Sullivan’s Ruddigore I wrote about on January 10. The company includes Orthodox and non-Orthodox Jews, as one might expect in Jerusalem. The audience at the matinee I attended was largely Orthodox. Perhaps someone in the audience flinched when the company sang “Real Nice Clambake,” which describes in great detail a codfish chowder with ribbons of salted pork (I distinctly heard the word “meat” substituted for “pork”), clamshells and red hot lobsters slit down the back, peppered, and doused in melted butter. “All the food products used on stage in this production have been certified kosher/pareve under rabbinic supervision. Although reference is made to shellfish, the items in question are only to establish the New England locale of the play and do not in any way constitute an endorsement of such eating habits. What Leviticus and the commentaries thereon have to say about clambakes in New England I do not know. What I do know is that no one would have considered a disclaimer like this necessary in Jerusalem 20 years ago. Holy mackerel. When they put on the Mikado again, will they need to write that actors seen bowing to the Japanese potentate are not really worshiping false gods? That evening, Helman gave a pathetic defense of the policy when grilled by two veteran Israeli journalists, Yaron London and Motti Kirschenbaum, on their nightly TV news show. How could we expect reliable coverage of the event if journalists were not allowed to witness it, London and Kirschenbaum asked. Helman had no answer. But he did say that the policy was the outcome of a series of meetings of top-level government officials. All of them suffering from a severe shortage of cortical neurons, he failed to add. You may never have to get from Zakynthos, the southernmost of Greece’s Ionian Islands, to Corfu, the northernmost of those islands, in a single day. But I had to do just that last week while on assignment; the two islands were part of a single story. Flying was not an option, and renting a one-way car involved an astronomical drop charge. Getting information on-line about public transportation from Zakynthos to Corfuwas nearly impossible. The ferry sites were unclear. Bus information was even murkier. A clerk at the Zakynthos bus terminal had no specific information but assured me I could get to Corfu in a single day. It seemed to make sense and gave me hope. The bus that left the Zakynthos terminal at 8:30 a.m. brought my husband and me to the ferry; the ferry ride to Kilini was smooth enough, and we continued on the bus to Patra. It was nearly noon when we reached Patra and discovered that the bus (which was continuing to Athens) was dropping us ten long blocks from the bus terminal. When we finally got there—a building that reminded me of Greyhound terminals in the southern United States in the early 1960s—we were in for a much bigger surprise. Though there are several ferries daily from Igoumenitsa to Corfu, the only bus to Igoumenitsa would be at 10:15 p.m. Arrival in Corfu would be at 4:30 a.m. Not what we had planned at all. There is no train service to Igoumenitsa. But the helpful clerk at the bus terminal suggested another option: a ferry directly from Patra to Corfu. Another ten-block walk brought us to a brand-new ferry terminal where we learned that yes, there was a direct ferry and it would be leaving at … midnight. Earliest boarding was at 9 p.m. and we would arrive in Corfu at 7 a.m. Returning to the bus terminal was so unappealing, we decided to stay put. At least the ferry terminal had air-conditioning, free Wi-Fi, a café, and shops. The ferry itself, the Europa Palace, was quite luxurious, but in the cheaper section, which had airplane-style seats, it looked as though we had unwittingly stumbled on an international convention of the homeless. Young people from many countries were stretched out on the floor in sleeping bags, their heads tucked inside or covered with jackets. The lone consolation was meeting a very bright student from Hong Kong who had just graduated from a university in Holland and planned to spend the coming year as a volunteer teacher in a village in rural China. He said he hoped to change a child’s life, just as one of his teachers had changed his. This Zakynthos-to-Corfu story has a happy ending: Corfu more than made up for the difficulties getting there. More about that soon. Text copyright 2011 by Esther Hecht. No portion of this text may be reproduced in any form without the express permission of Esther Hecht. Kirstin Lewis has a luminous soprano voice and is personable both onstage and off. A river of rippling blue light flowed diagonally across the stage. The performance was a dress rehearsal for the second annual Opera at Masada event. 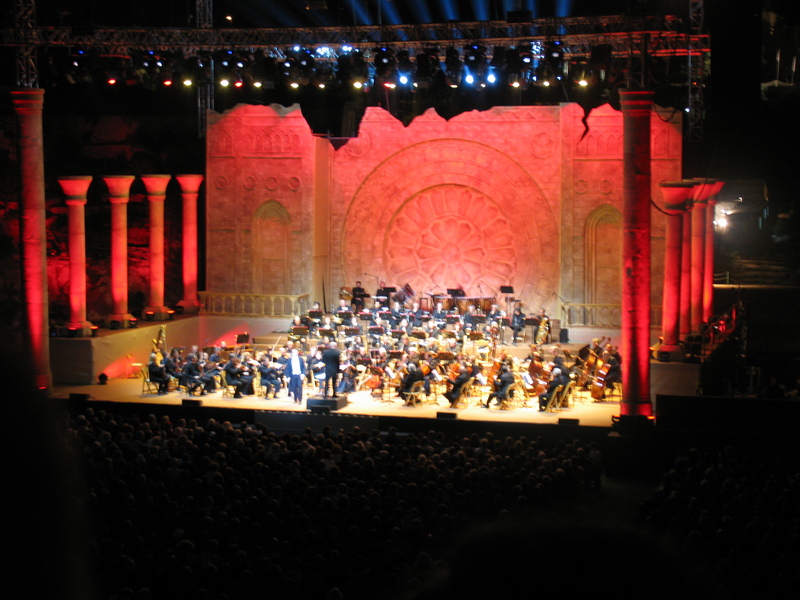 Last year, more than 50,000 people, including 4,000 tourists who had come specially for the musical events, saw the Masada performances of Verdi’s Nabucco and a gala concert by Jessye Norman. 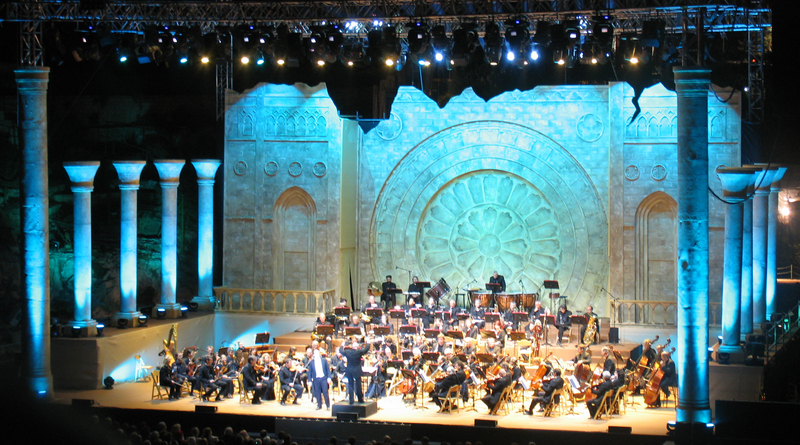 This year, similar numbers are expected for the four performances of Aïda, a concert by Italian tenor Andrea Bocelli at Masada on June 12, and more Verdi and other concerts in Jerusalem in early June. Bringing the Israeli Opera from its Tel Aviv home to the foot of a mountain in the desert, in the lowest place on earth, is a huge challenge. It was certainly grand last night. Though conductor Daniel Oren walked in with a towel draped over his right shoulder, as if setting a casual tone, the music was sublime and the soloists were superb. Even the plot unfolded with inexorable logic: Ethiopia and Egypt are at war. Aïda, the daughter of the Ethiopian king but now a captive slave in Egypt, is torn between her love for the Egyptian hero Radames and her duty to her father and her people. It is an impossible choice, and the end is tragic. The costumes were light and breezy, designed by Denise (Katia) Dufolt for desert conditions. Last night the wind kept blowing, billowing the gowns in a way that added drama to the scenes, though at one point Amneris, Aïda’s rival in love, had to beat back her full and flowing robes. The set was suitably majestic, with two sphinxes on either side of the stage and an enormous bust of the pharaoh at rear center. In one act two obelisks rose on the stage. Opera is spectacle, and there was plenty of it, including a brief burst of fireworks and a scene in which Aïda arrives onstage mounted on a camel, with camels also passing in the background. In another scene, Amneris arrives in the royal barge, the waves created by dancers repeatedly flashing the shiny blue lining of their full skirts. 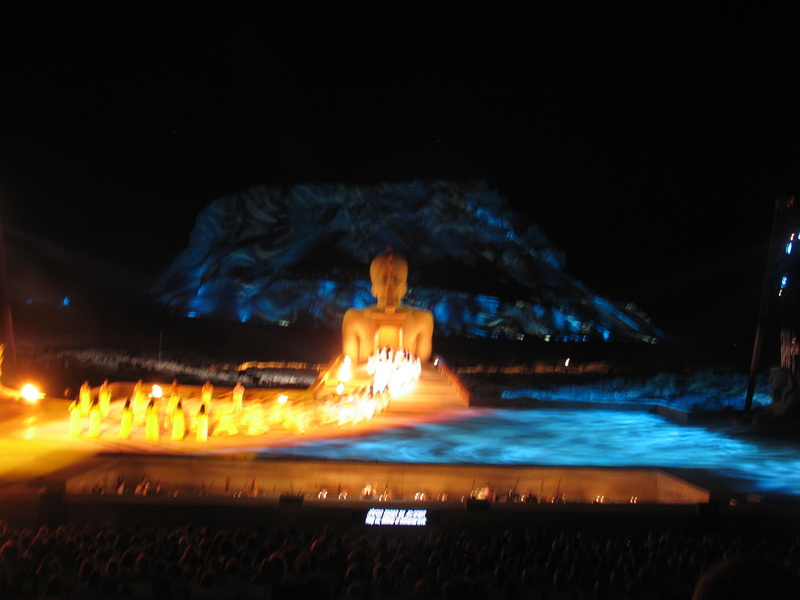 But the overwhelming winner in terms of spectacle was the lighting, by Avi-Yona Bueno, who also created the effects for Nabucco. Bueno “carpeted” the stage with light patterns. Most effective was the Nile, which “flowed” diagonally across the stage with convincing ripples in the back. Even the 1,400-foot-high Masada was bathed in rippling blue light. This was, however, a rehearsal, and at two points the conductor’s comments broke through the high drama. For the triumphal march in the beginning of Act II, the trumpeters came onstage a few seconds late. “Who gave you the signal?” maestro Oren asked with annoyance. It turned out that one Gadi was the culprit. By the time of Aïda’s Masada premiere, Saturday night, I’m sure the kinks will be ironed out and Verdi’s masterpiece will do its magic. Last night, even with the kinks, Aïda was magical.